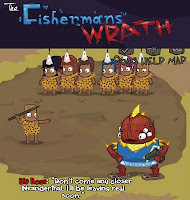 The Fisherman's Wrath is a new hilarious adventure game from enalpria entertainment. You play as the fisherman whose mission is to save the women and children of your village that were abducted by aliens and to be taken to their planet to be pets of their kids. It does not sound good so you have to find reflective emeralds scattered around - the only thing that can defeat the alien invaders. But gathering those shiny stones is no easy task because you will have to do extraordinary feats like dressing up like a fish or a tree as a disguise just to get pass the hazards. You control your hero using directional keys on your keyboard for moving around while Z to stab, X to throw and C as action button. You can tailor your disguise inside your cave. This game is so hilariously fun although some actions are a little off like using the weapons, but don't worry, it doesn't spoil the game at all. Meanwhile, if you got really stuck view The Fisherman's Wrath walkthrough which shows how to beat the game.